Isaac Newton may have shaped the world we live in today more than anyone else on this list. His theories and discoveries are still relevant today, hundreds of years after his death. It is hard to decide where to start when considering Newton´s impact on the world: building the world’s first reflecting telescope, separating white light into the colours of the spectrum, developing of the mathematical relationships of calculus or describing the behaviour of fluids. His career was certainly varied and distinguished. Of course, he is best known for his work on motion and gravity. He was able to describe the motion of objects and the effect that gravity had using mathematical relationships. 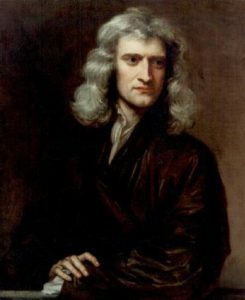 Newton’s laws of motion and theory of gravity are as important today as they were when he first discovered them. These laws are applied by space agencies. I cannot overstate their importance. The unit of force is also named after him, a Newton (N). This unit of force links mass to gravitational pull, amongst other things. However, not all of Newton’s work was successful. He spent a lot of his career attempting to turn base metals into gold, also known as alchemy. It is likely a myth that Newton discovered gravity after an apple fell on his head. To suggest that such a complicated piece of work as quantifying gravity arose because of a chance event of an apple falling on his head is rather disingenuous.